Kevin Hart has to be one of the hardest working men in show business at the moment. He has a successful career in stand-up comedy, a popular television series in Real Husbands of Hollywood, and numerous film projects in various stages of development. With the buddy-cop movie Ride Along Hart is attempting to make the transition into the realm of the “above the title” movie star. Hart plays Ben Barber, a security guard in an Atlanta high school and an avid gamer, who has finally been accepted into the police academy. With his life falling into place, he plans to propose to his girlfriend, Angela, but first wants to get the blessing of her protective older brother, James. James is a cop himself, of the lone-wolf variety, and demands that Ben prove himself capable of looking after his sister before he will grant his blessing. So James invites Ben to ride along with him for a day to test him out. 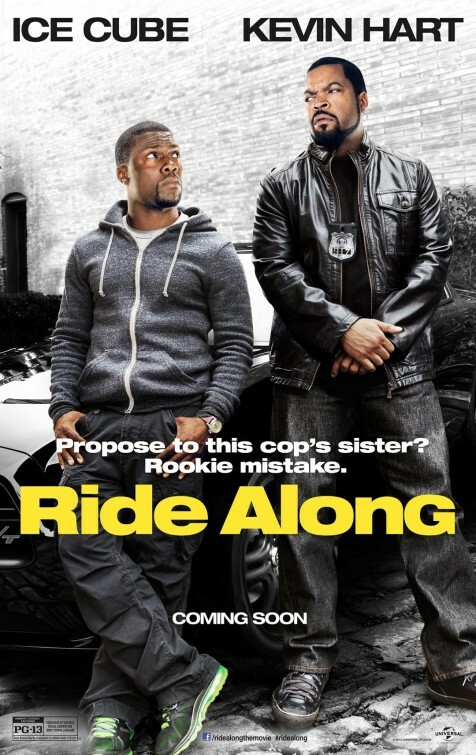 Ride Along fancies itself as a comedic take on Training Day, and the numerous references to the film are obviously intended to make sure the audience draws that connection, but really what we have here is an action comedy in the tradition of Beverly Hills Cop, Lethal Weapon, 48 Hours and Rush Hour… though not quite as good. The action-comedy is a genre we don’t get as much of these days but it is a proven star maker and the ideal genre for someone of Kevin Hart’s talents. In Ride Along Hart is playing that Eddie Murphy role (from back in the days when Murphy limited himself to playing just the one character in each film), that fast talking, energetic, comic character. If this review seems to be all about Kevin Hart it is because when it boils down to it, Ride Along is all about Kevin Hart. The film is at its best when it puts the progressing of the largely ho-hum storyline to one side and just lets him be the focus. Watching this loud, motor-mouthed but ultimately extremely unqualified character attempting to handle police situations is quite fun. His co-star Ice Cube, on the other hand, is a bit harder to handle. Whether by design or simply through his performance, Cube’s character just comes across as very one note. There is no light and shade, no real character development. What he does do is demonstrate how difficult it actually is to play the straight man opposite the clown. Ride Along is a very formulaic film, but let’s face it, no one is going along to see this movie hoping to be challenged in any way. Its formulaic nature makes it comfortable, and if you come in with sufficiently low expectations there are some genuine laughs here and there is some fun to be had.